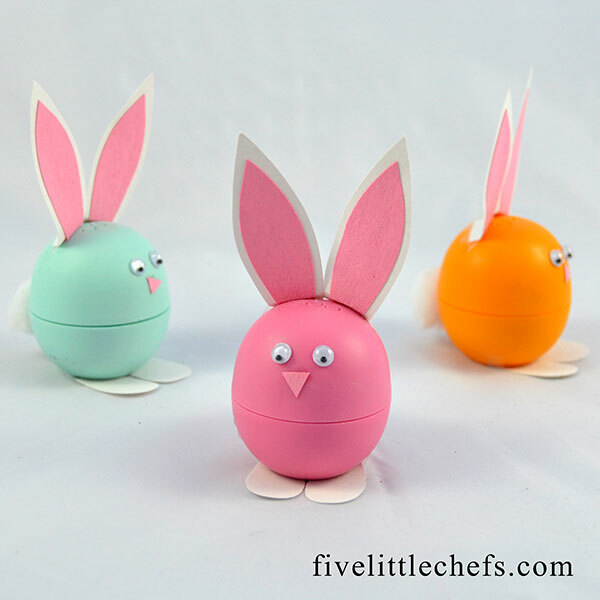 Easter is almost here and I want to share these easter bunny crafts that are cute as well as functional. Easy crafts are the best, especially when you are crunched for time. 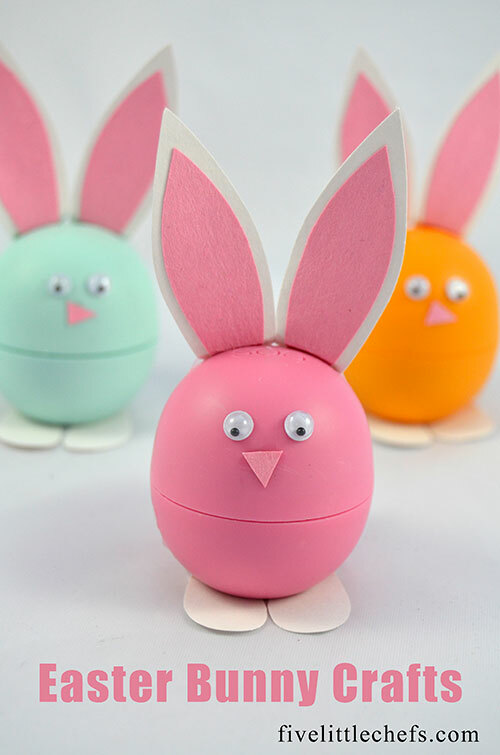 This easter bunny craft can be made within 15 minutes after gathering supplies. Don’t worry most of the supplies are common crafting items. My kids are loving the EOS chapsticks. I’m not sure if it is because of their very distinct shape or because all their friends seem to have at least one. They have been begging me to get them each one and I finally caved because I thought it looked like an egg. Little Chef A saw the aqua color and thought if we speckle it with black paint it would look like a robins egg. Yes it would and it would be a fun easter basket addition. Cut out the pink bunny ears. 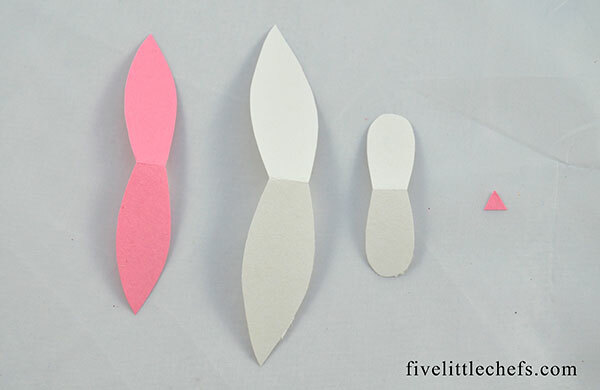 Fold your pink paper over about 2″ and cut the shape of an ear using the fold as the base. You will cut out two ears at one time. They will be connected at the base. Cut out the white bunny ears. Fold your white paper over about 2″. Using the pink ear as a guide cut a white ear a little bit bigger. Using the white folded paper cut out a foot shape. Using the fold you will cut two out at once. Using the pink paper cut out a triangle nose. Glue the pink ear to the inside of the white ear. Glue the ears to the top of the EOS. Glue the feet to the bottom. Glue the pom pom to the back flat part as a tail. Attach the googly eyes and nose. Admire your easy bunny crafts. 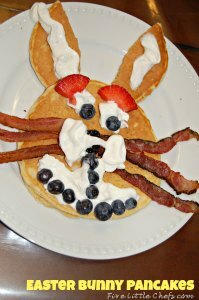 For more bunny ideas check out these easter bunny pancakes. 6 Replies to "Easter Bunny Crafts"
This is really cute! My kids would love it! I like it, very creative and cute. That’s look like a craft that my girls would enjoy. These are soo cute! And what a great Idea for an older girl’s Easter basket! Thanks for pinning on the P3 Party Board I will be featuring you Friday on the blog! I love this!!! ♡♡♡ It is adorable.